I will once it's done. atm it's not quite rdy, some rocks decided to move and block off some water entrances. as well don't like the way the Villa's are stacked on top of each other in the middle. there are 4 more villas in the middle that are under the water, can walk on the roof of them, but with the way the villas above them are, causes invisible walls and don't work the way I want them too. May Move this to the Lake in the middle with the big damn. that way you can enter the building while it's underwater. With it on the ocean, ya can't go under the water, but lakes and ponds waters are different and you can go under the water and walk around. Which is what I was looking to do, but decided to test it on the ocean first. I decided to use this as the Tip of the AI Mountain that i'm making. going to have many caverns and passages in it with AI roaming around and a few AI stronghold type places inside. Thinking it's about 3000m across at the base, have to measure it later on to see. Main thing i'm not liking is the fact that there are not many large rocks to choose from, so the hard part is avoiding a repeating pattern of the rock surfaces. would be nice if the vectoring in the editor would stay sideways or flipped when ya move them, but sadly, once ya add the vector variable to the biedi file and then load the map with the changes, the rock is at the different angle that ya want, until you go to move it and put it were ya want it, it goes back to it's original right-side-up type position, until ya save and reload the map. but that would mean move it, save it, add vector variable, reload map, see if rock is were ya want it, if not move again and save then reload it each time. That's a lot of save/reload work/time on something that is going to be at least 1000m across, and at least 500m upwards. I still have lots left to do on this and the map itself, with redoing the trader system and the AI systems and custom mods. But it will be worth it in the end as it will be a be a very unique place for our players. The large industrials with the roller doors have a flaw that will cause them to blow up with a single hand grenade. I believe that they're not apart of the map but nevertheless,a lot of people have them installed on their servers. Whatever you do don't make a base inside one, not of you don't want all your vehicles blown up. found all 5, once you find 1 the rest jump out at you and are really easy to spot. i can confirm no vehicles will fit in any of them except bikes, motorbikes, quads. Are they actually like caves, or more like rock shelters? I don't know how I haven't come across them.. though I was running a server before they updated the map and I haven't really been looking. Wtf, doesn't that murder fps having all that crap in one place like that? I messed around doing that crap in the editor just for sh!ts but figured it wouldn't work well on the server. I placed the Volcano on the server as a test and the players only experienced a slight drop in fps, but not too much. I can fly around inside it and stuff without any fps loss myself, but then again, I'm running a decent pc system I built. One of the reasons i'm redoing our NAPF server, is it was having some fps issues and whatnot, before i even thought of Mt.WTF. since placing this, I have done some server cleanup to improve server performance. and things have gotten better. I left this on the server for a few days and then removed it for a few days, when I put it back yesterday, I asked if fps got worse, and they said they didn't see a drop after adding it back. During the server redo i'm doing, I'm doing everything to optimize server performance, and keeping the MPMissions folder as small as possible by putting all my edits (or as many as I can) in the server pbo. As well we are not limiting our server by using one of those server hosting companies.  we have a dedicated server, so I can get my hands dirty and fine tune everything without having to use some server control panel or asking server company permissions to add or alter or server files. The Five Caves I found after the updateare not base worthy, barely big enough for a poor depressed hobbit that has been vanquished from the shire. They would make great locations to setup as AI mini base camps. Killhouses are fun, I keep bugging one of our players that based in one..I'll look at him and tell him he needs to fix that hole in his wall, then I shoot the hole open...lol. I posted one in spoiler on page 2 but propably it's not the one you talking about. Theres a couple other minor easter eggs...but it would be difficult to know when you found one. 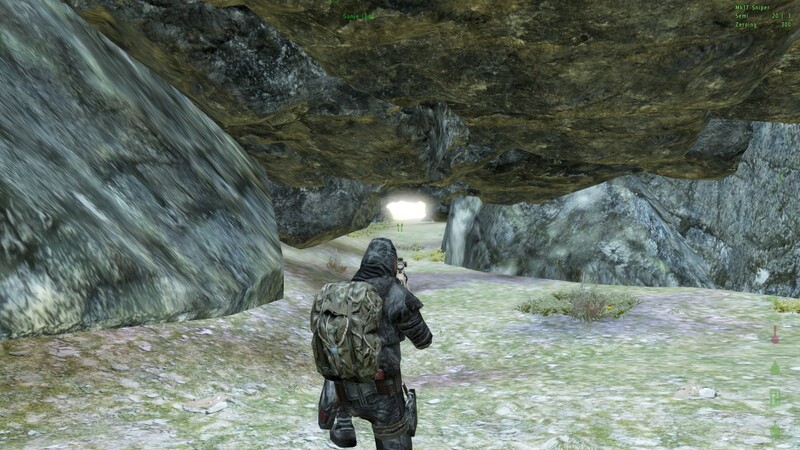 Does anyone care sharing the locations of these caves? Been dying to find them... Only came across one so far, but it was already taken. Mid-South, east of the dam lake, and a couple near the split in the ridge down there as well. 2 easy ways to find them. 1st) Look at your map, look for the spots that indicate large rocks. on the map they look like grey squares, some may have a lighter grey almost white section in the middle of them, those are typically were you can fin caves. 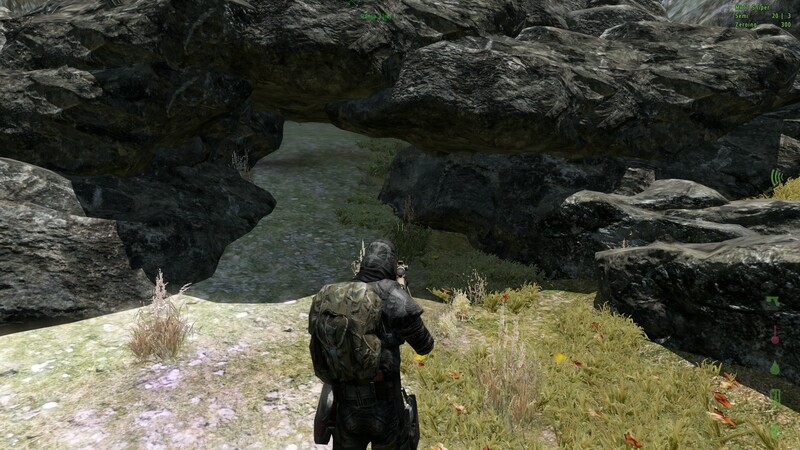 2nd) use a heli and scout the areas, look for rock formations that are "out of place". These don't look like normal or natural rock formations, but will be mix'd in with the normal rocks, so can be hard to spot. 3rd) easiest way to find them....Join your fav NAPF server and then exit the server, but not the game, at the main menu of ArmA2OA hold down "Alt" and hit "E". This will bring up your map editor, then just use the 3D map editor to "fly around" and have a look. theres 4 around the mountain east of the dam. one between giswil and brienz. When I I found them I started posting about them here on this Thread. Yea I've found 5 so they do exist. I have my base built utilising the largest of them. Just found another one..this is the biggest one yet.